The history of psychiatric institutions and the psychiatric profession is by now familiar: asylums multiplied in nineteenth-century England and psychiatry established itself as a medical specialty around the same time. We are, however, largely ignorant about madness at home in this key period: what were the family’s attitudes toward its insane member, what were patient’s lives like when they remained at home? Until now, most accounts have suggested that the family and community gradually abdicated responsibility for taking care of mentally ill members to the doctors who ran the asylums. 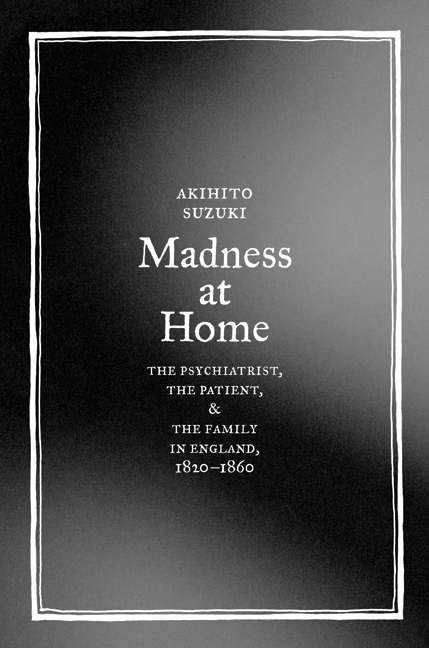 However, this provocatively argued study, painting a fascinating picture of how families viewed and managed madness, suggests that the family actually played a critical role in caring for the insane and in the development of psychiatry itself. Akihito Suzuki’s richly detailed social history includes several fascinating case histories, looks closely at little studied source material including press reports of formal legal declarations of insanity, or Commissions of Lunacy, and also provides an illuminating historical perspective on our own day and age, when the mentally ill are mainly treated in home and community. Akihito Suzuki is Professor of History in the School of Economics at Keio University, Japan.